FORMED in 1975 in response to properties falling derelict as a direct result of the early stages of the Troubles, Newington Housing Association has gone from strength to strength in providing homes for the people of North Belfast. A voluntary, not-for-profit organisation, Newington is governed by a Board of Management consisting of unpaid, community-minded locals. It was one of the first housing associations established at the time, set up by a dedicated group of concerned people in the local area, including clergy and local professionals, intent on regeneration for the good of the people. Anthony Kerr, Director of Operations at Newington Housing Association, said the organisation was and is about making houses homes for people in need. “Over the years, we have established shared areas which have been regenerated,” he said. “It is not about building houses – it is about making homes for people. We are like any housing association with an established process on how someone gets a home which is based on need. “To put it in simple terms, we are a charity, non-profit organisation that provides a service for the community. “There are very few housing associations that are strictly community-based like ourselves in that we maintain a significant presence in the area. “The cultural aspect is also important for us. We believe it is important to engage and form partnerships within the local community. Everything we do has that partnership focus. “We try and communicate as best as we can with our tenants and the establishment of a new tenants’ forum has helped in that respect. We want our tenants to shape the services that the association provides and how they are delivered. One such tenant to benefit from the community ethos of Newington Housing Association is Geraldine Crossey. A long-term tenant, Geraldine suffered ill-health recently, resulting in her being wheelchair-bound. The two-storey property she was living in was incapable of being adapted to meet her changed circumstance. 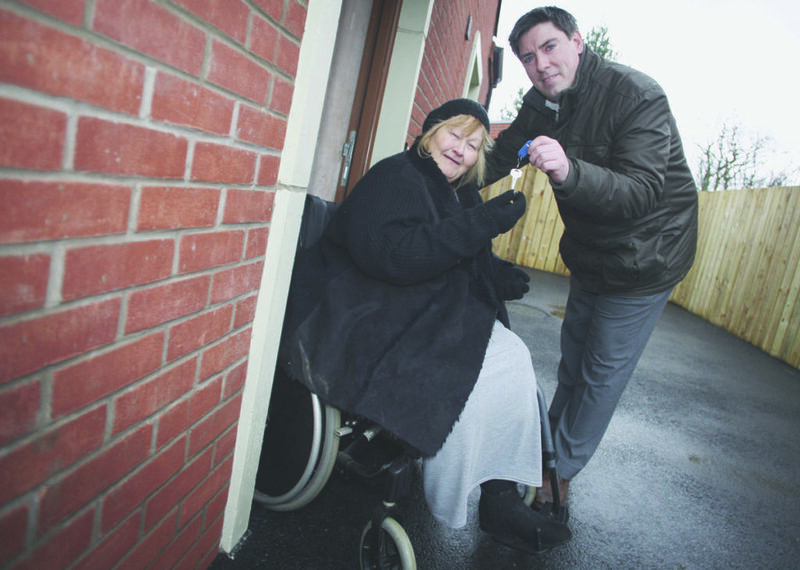 Geraldine sought the help of Newington Housing Association and this week received the keys to a specially-adapted property in Parkside that will meet her housing needs. Furthermore, Geraldine has been housed close to her daughter, who lives just across the road – an added bonus. “It is all about putting the tenant first, we base our ethos on how we would like our own family members to be treated,” added Anthony. Looking ahead to the future, Anthony is predicting exciting times in the development of Newington Housing Association. “There have been huge changes in the last few years with over £22 million invested in providing new homes in a number of areas of North Belfast, including Girdwood and Limestone Road. “We are a growing organisation, committed to keeping the focus on our tenants. “We are also trying to locate new offices but don’t want to lose the community-based ethos we have established. Newington Housing Association is located at 300-302 Limestone Road, Belfast, BT15 3AR. Email admin@newingtonha.co.uk or call 02890 744 055. Best of the West update!